Come and join the team at the Tenerife Diving Academy for some fun scuba lessons in the pool from age eight children can use the full set of scuba equipment to learn to dive. This is all about having fun in the swimming pool, blowing bubbles. What a great way to introduce children to scuba diving in a pool in less than 2 metres of water! The PADI Seal Team program is broken into two parts. Part one, AquaMissions 1 – 5, teaches kids the basics of diving – things like buoyancy control, mask clearing, regulator recovery etc. After building a solid foundation of scuba skills, children move on to part two. Part two is full of specialty AquaMissions, which usually last about an hour. Learn all about your scuba gear with PADI scuba lessons. In the PADI Open Water Diver course, you learn to use basic scuba gear including a dive computer, and standard accessories. You breathe underwater for the first time (something you’ll never forget) and learn what you need to know to become a certified diver. Looking to experience something different and learn some new skills? You can try your hand at digital underwater photography, diving with underwater scooters, peak performance buoyancy and much more. One reason you’ll love the Junior Advanced Open Water Diver course is that you and your instructor choose from 16 types of Adventure Dives to complete your course. You can try your hand at digital underwater photography, wreck diving, , diving with underwater scooters, peak performance buoyancy and much more. The Best Way to Dive with the PADI Master Scuba Diver rating, you have reached the highest non professional level in the PADI System of diver education. It means that you have acquired significant training and experience in a variety of dive environments. 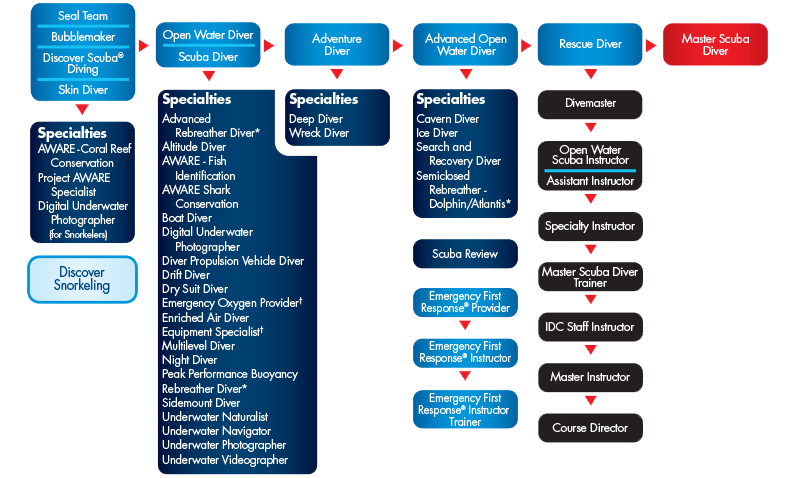 See all the specialty diver courses offered.